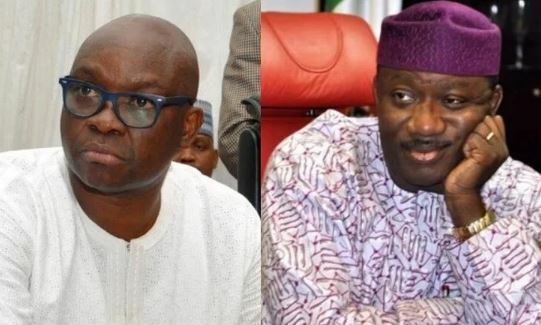 The Governor of Ekiti State, Mr Ayodele Fayose, has stated that he is likely not to honour invitation to attend the inauguration of Dr. Kayode Fayemi because of the erratic nature of politicians. The Governor added that he had promised to appear at the office of the Economic and Financial Crimes Commission(EFCC) on October 16, which he said coincided with day of the swearing in. The governor also advised that whoever emerges Speaker in the state House of Assembly should work for the progress of the state. Fayemi had on Wednesday disclosed that Fayose was specially being expected at his swearing in on Tuesday, saying he is free to attend the ceremony as Ekiti leader. Speaking at a press conference in Ado Ekiti on Thursday, Fayose said the EFCC may have the opportunity of harassing him if he reneged on his promise to appear before it next Tuesday. “Again, I have to be in EFCC office in Abuja on Tuesday. But let me say clearly that I am ready to appear before any Panel set up by incoming government to probe my administration”, he said. Fayose stated that he has not committed Ekiti to any debt, either by way of bond or bank loans since he took over in 2014. “Contrary to what they are saying that I have committed Ekiti to a huge debt, I didn’t commit Ekiti with a dime. Whatever we do in government, history will forever remain after us”. He urged Fayemi to deploy the N327 million kept in bank by his administration to complete the new Oja Oba market for the use of Ekiti traders. The Governor added that he decided to abandon the civic centre project started by Fayemi and constructed a new market because it was not a priority to the people of the state. Fayose said the newly built Ministry of Finance shall be named after former Minister of National Planning, Chief Ayo Ogunlade to appreciate his contributions to the state. The governor said he decided not to name any project after himself on the basis of his belief that such was morally wrong. “The flyover, the new governor’s office, the roads, the Oja Oba market, the Funmilayo Olayinka Women development centre and other projects will speak for me even if I refuse to name projects after myself,” he said. Fayose said he won’t dabble into the crisis rocking the State Assembly, which culminated in the removal of the Speaker, Hon Kola Oluwawole and his deputy, Sina Animasaun on Thursday. Three All Progressives Congress (APC) and 11 members of the Peoples Democratic Party (PDP) on Thursday removed the principal officers and installed an APC lawmaker, Hon Adeniran Alagbada, as the new Speaker. Fayose said: “I won’t dabble into what is happening in the assembly. Whether they elect Oluwawole or Alagbada, such person must believe that he was elected to serve Ekiti people. “I enjoin them to cooperate with Fayemi to move Ekiti forward. I don’t want to hear of any impeachment against Fayemi, if truly we are here to serve”, he advised.